1- Faculty of Medicine, Third year students. 2- Faculty of Medicine, Third year Malaysian students. 3- Faculty of Dental Medicine, Second year students. 4- Faculty of Physiotherapy, Second year students. 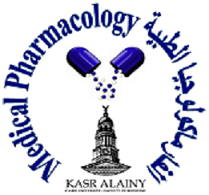 5- Faculty of Clinical Pharmacy, Fourth year students. 5- Faculty of Nursing, Second year students. 7- Secondary school for Nursing. 2- Master of Clinical sciences. 3- Master of Dental sciences.